The Copenhagen Half Marathon started on Sunday September 17th 2017 in fantastic weather – sun and just around 20C. Mark participated in the run as a part of his training towards the Athens full marathon later in November. Due to the weather conditions he decided to run for a new personal best. First 10 km went perfect but then it became more and more cloudy but still rather well for Mark. When he came to the 18 km mark it suddenly became almost totally dark and the thunder started. Short after the rain just fall in an incredible amount. Thunder went on non-stop and it was just on top of the runners. Mark don’t remember ever have been running in such a weather. 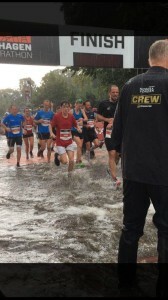 When he came to the last part of the run it was like running in a river. Shoes of course full of water but now the water also was full of hail and it was really cold. At the finish line the chaos became more and more visual – everything were totally wet and during one of the thunder the electricity for the time counting went down. 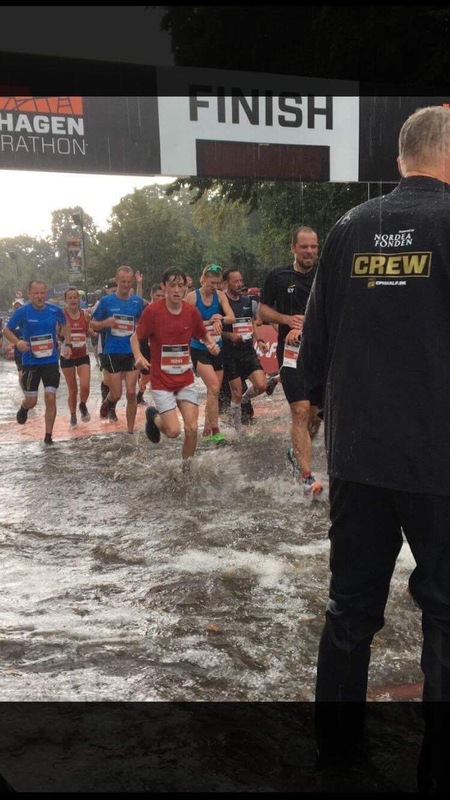 The organizor decided to stop the race as the runners were in danger and weather forecast did not show any better for the coming time. Later it was informed that three persons – hereof one runner were hit by thunder and all brought to the nearby hospital but luckily without any serious injury. Congratulation to Mark and thanks for sending pictures from the event which can remind us about the power of nature and that we have to be careful when running out there.